Here is the list of T Type events for 2017. The T Register will once again have a stand at this show at Stoneleigh and you are all encouraged to bring your unwanted spares along to the stand to sell to potentially lots of enthusiastic buyers. 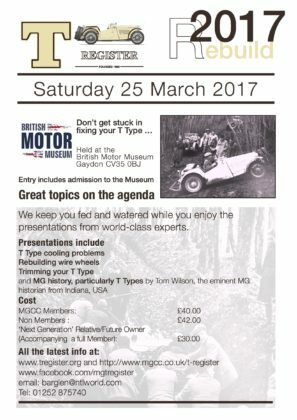 This will once again as in previous years be at the British Motor Museum, Gaydon CV35 0BJ and entry includes admission to the Museum. There will be great topics on the agenda as usual and you can download a paper application form for the event or get it from Safety Fast! in the January 2017 issue. There’s also a Word doc application form you can fill in on your computer and email off to Barry. There was an advert for the event in the February issue of Safety Fast! Don’t forget we keep you fed and watered while you enjoy the presentations from world-class experts. or for more information, email Barry Knight or telephone him on 01252 875740. The AGM of the T Register will take place immediately after the Rebuild Seminars at approximately 4pm. The Secretary, MGCC T Register, 29 Church Street, Ampthill, Bedfordshire MK45 2PL. Update on this event 15 April 2017: the hotel we had booked has suddenly and unexpectedly ceased trading, but the good news is that Bill and Sally Silcock have sorted a new hotel which looks just as good, if not even better. It looks to be quite used to dealing with classic car clubs – have a look at their car park and you’ll see what we mean. Bill and Sally thank you all for the many messages of support the’ve had about the forced change of venue – they’re very much appreciated. The new hotel is the Castel de Pont-à-Lesse. It’s got an indoor swimming pool and extensive grounds. The grounds include a tricky-looking crazy golf course, so there might even be an evening tournament! There’s also rock-climbing in the grounds, if anyone feels like having a go. More seriously, the parking includes a secure area at the back of the hotel complex where we can park overnight; the access from the road is locked at night, and there’s no vehicular access to it from anywhere else. There’s free WiFi everywhere in the hotel that we went, and it works. The paid deposits will be transferred from the old hotel to the Castel de Pont à Lesse. All the participants should have received an email from Sally about all of this but if you someone who hasn’t, get them to contact Sally immediately, the details are below. Update on this event 22 March 2017: the spare place that was available due to someone giving backword has now been filled. If you still wish to go, a waiting list is being kept in case anyone else gives drops out. Below is the information on the event and details on how to apply. Following on from the successful Spring 2016 foray to Normandy, Bill and Sally Silcock are arranging a Spring tour to the Ardennes. Here are the details. The nearest ports are Calais, Dunkirk, Zeebrugge and Hook of Holland – the hotel is about the same distance from all of them. As usual, those going on the tour will need to organise their own ferry or Eurotunnel booking. We intend to include in the final briefing a suggested scenic route from a point a couple of hours from the hotel, but this of course is optional. There are a number of scenic routes in the area, including some recommended by the Michelin guide to the region. There are also lots of places worth visiting, including particularly good caves at Han sur Lesse, a micro-brewery near the hotel and a castle at Bouillon. As has recently become the tradition on our continental tours, there won’t be any set routes or timetables, but we will provide lots of information about the area, and we have re-checked the routes from 2008 and will update them and make them available to anyone who wants to use them. If you would like to visit the Han sur Lesse caves please let us know – we may be able to get party rates and an English-speaking guide if sufficient people want to go. Please e-mail Sally Silcock at treg.sec@virginmedia.com or telephone 01525 750468 to express you interest in this trip. If phoning, please leave contact details (preferably an e-mail address) so that we can contact you when necessary. 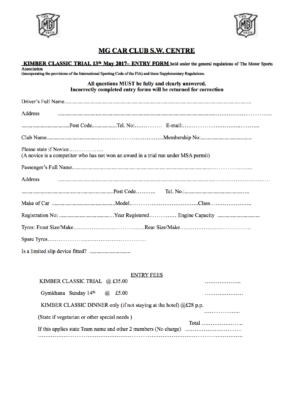 Not strictly a T Type event but the annual Kimber Classic Trial will be celebrating its 80th Anniversary this year on Saturday May 13 2017. The MGCC SW Centre has cordially invited all T Types to enter this year’s event which was won in 2015 by a TA. You do not need a competition licence to enter, just a current Club membership card. This event is the longest-surviving competition in the MGCC calendar. You will be welcome whether as a competitor, a marshal or a spectator at the base HQ which is at The Lanes Hotel at West Coker, near Yeovil in Somerset, where there will be an informal dinner on the Saturday evening. John Ward has written more about it in the T Register’s Safety Fast notes for February on page 86.
or Alan Grassam or telephone 01935 863673. 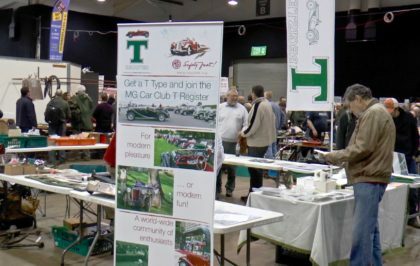 The T Register at MG Live! The T Register will have a presence at MG Live! The display of XPAG Specials will be there, accompanied by the informal natter on the late Saturday afternoon. But there will be no best stand competition in the main marquee this year – a pity, we liked our friendly rivalry with the Caledonian Centre! Talking of the XPAG Specials display, Stewart Penfound our XPAG Specials Registrar has written a brief history of both them and the display we can expect at Silverstone on the Saturday and there is a separate page with his knowledgable description available. T Register racing will be on the Sunday of the event. See more on the MG Live! website. The California Cup and Autosolo at MG Live! These two events have been moved right to centre stage for this year’s MG Live – they will be held on the tarmac area just outside where the main club marquee is normally and where the concours was held last year. In previous years they have been held in the car park near the Silverstone entrance where you had to be keen to go and see them. So … the T Register has been asked to enter a 3 car team for the California Cup which is an autotest or driving test – you can read all about them on the club’s motorsport page. You don’t need a competition licence but you do have to be a MGCC member, and entry is free. You do need to read the Regulations and complete an Application Form, and here it is as a Word file as well. You can also enter for the Autosolo as well as an individual. Autosolos are a bit like autotests except that there is no reversing involved, and again, you don’t need a competition licence, you do need to be a MGCC member and entry is also free. Here’s the link to the Regulations and Application Form, and as a Word file as well. 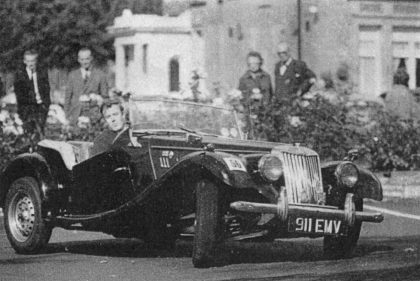 The picture shows Roger Wilson in a TF1500 competing in an MGCC autotest in the 1960s. We have been advised that the club booking scheme will close at 10pm on Wednesday 21 June, so if you want to go, you need to book your tickets before then! 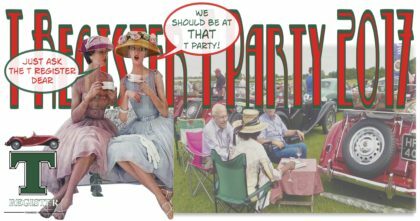 Although we will not be holding our T Party at the Flywheel Festival as it’s the week after MG Live (see the next event entry below for the T Party arrangements), the organisers have generously given our members the normal club discount and parking in the general parking area for classic cars at the event. So hardened classic car event goers may still like to go. So if you want two great weekend classic car events in a row, here’s your chance. Instructions appear at the top of the booking page (link below), so please read them carefully. In order to park in the general club parking area, you must select a free-of-charge club parking ticket from the ticket options when booking your ticket (and make sure you select the parking ticket for the day you have chosen to attend!). During the booking process you will see a drop down menu of club names – make sure you select MG Car Club T Register. 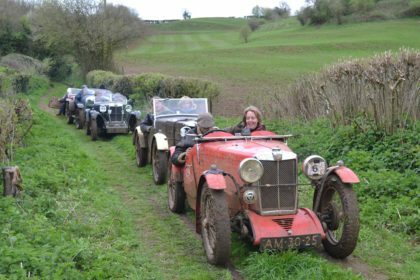 This year the T Register will hold their T Party at the Chateau Impney Hill Climb event near Droitwich in the West Midlands on 9 July. There’s a 1000 yard technical hillclimb with classic sports and racing cars all before 1968 with many pre war classes, an open paddock, a concours and a vintage funfair for you to enjoy. And dedicated parking for T Register members. You can see what the event is like by having a look at their website. There’s a video of the 2016 event on YouTube. We will be attending as part of their Associated Clubs scheme and the cost will be £22.50 per person. To apply for tickets you will need the T Register’s own offer code and then visit the Chateau Impney ticketing website. 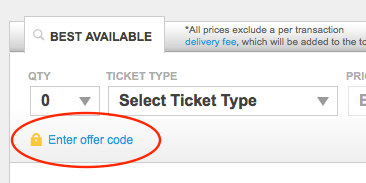 Choose the Sunday ticket and then on the next screen enter the code before you select the ticket type. Then on the next screen enter the number of tickets you want next to ‘Promotions and Special Offers’ and then click Find Tickets. Note that the offer code will also work on the Weekend ticket option as well should you wish to spend Saturday and Sunday there, and reserved parking for T Register cars will be available on both days. You can print your tickets yourself or for an extra charge have them posted to you. The offer code will only apply to MG Car Club T Register members and will be published in the monthly email Newsletter. You can also contact David Wardell for the code – make sure you include your MGCC membership number. For other queries about the event, contact Alan Wakefield or phone him on 01932 873170. The details of this year’s Autumn Tour have been released. It will be based at Shap between the Lake District and the Yorkshire Dales, and is being organised by Grant and Barbara Humphreys, who always put on an excellent event. Dates are Friday 1st September to Monday 4th September 2017, and the hotel they have chosen is the Shap Wells Hotel which is in a country house just outside Shap village. Grant has negotiated an excellent price of £96 per room per night for dinner, bed and breakfast in a double or twin room (equivalent to £48 per person per night), and initially reserved 40 rooms for our use. Bookings are open now: please book your rooms direct with the hotel on 01931 716628, and mention that your booking is for the T Register Autumn Tour in order to obtain the above price. The hotel will take a non-returnable deposit of £48 per room at the time of booking. When you have booked the hotel, can you please email Grant Humphries to let him know, so as to cut down on administration. Meals will be taken in the restaurant on the Friday and Sunday nights, and you will be asked to pre-order your food at a later date; our normal gala dinner will take place on the Saturday. 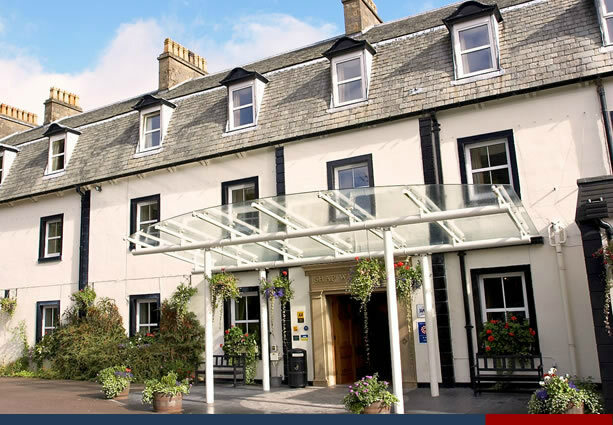 In addition to the hotel costs indicated above, there will be an event entry fee of £45 to cover organisational expenses, and wine for the gala dinner. Details of what and how to pay will be publicised once they are known. There is still discussion taking place amongst the T Register racers as to whether to go for the popular 4 hour Relay race at this event.